Dance Mogul Magazine is honored to present Aqura Lacey, another young woman in our culture who exemplifies what success truly means in our industry. Even with her many accomplishments with her rising career she is still humble and giving enough to share. She has not forgotten her humble beginnings and the people that have contributed to her life, we hope that the youth can take from her attitude blueprint and apply it to their own journeys as they figure out their own path in life. 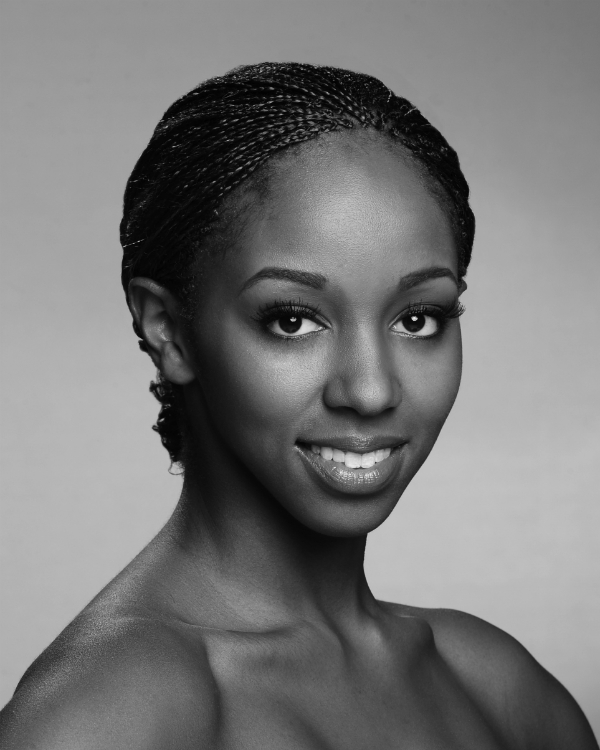 Aqura Lacey (Chicago, IL), was raised in Louisville, KY and began her dance training at the Kentucky Centers ArtsReach program at Louisville Central Community Center under the direction of Geraldine Woods and mentor, Aundra Lafayette. She also trained at the Louisville Ballet School as a scholarship recipient and was a student in the Ailey Fordham B.F.A program. Ms. Lacey has attended summer intensives at The Ailey School, Craft of Choreography Conference, and Earl Mosley’s Institute of the Arts. Ms. Lacey has performed works by Camille A. Brown, Ronald K. Brown, John Keen Miller, and Darrell Grand Moultrie. This is her second season with Ailey II. Aqura Lacey: I was about 10 or 11 and I started dancing at the Louisville Central Community in Kentucky. It was just an after school program and the LAST thing I saw myself doing was dancing. My first dance teacher, the beautiful Ms. Aundra Lafayette, had us performing in churches wearing costumes the parents pitched in to make. The movement wasn’t so technical but she made it seem so fun. I started to look forward to her classes and moving my body in ways that I had never even imagined. Aqura Lacey: Ms. Aundra was my very first inspiration. She has such a contagious spirit that reflected in her teaching and dancing that just made me want to move like her, listen to her and emulate her energy. She would tell us stories about the Alvin Ailey American Dance Theatre, and I later went to see them, my next inspiration, with her. Needless to say, watching Revelations especially changed my whole perspective on dance and its possibilities. Aqura Lacey: Being from the south side of Chicago, IL, Englewood to be exact, at a young age it took an effort to not be involved in the streets. My mother passed when I was 9 and I had never met my father. My Grandmother Delores Lacey-Wilson and my Auntie Sheryl Lacey made sure that I would have a different life. I moved to Louisville, KY with my Aunt, my grandmother would travel back and forth and they ensured that I stayed on track. These were the two most influential and supportive women in my life. Aqura Lacey: Eventually the director of my community center, Ms. Geraldine Woods, went out of her way to earn me a scholarship the Louisville Ballet School. I began training under Chris DeNofrio. Being a late starter in the ballet technique, with his patience and dedication I began to establish a strong foundation. After a couple of years at the ballet school, summers at the Ailey School and working with different choreographers over time, I started to feel more and more hungry for information and experience in dance. 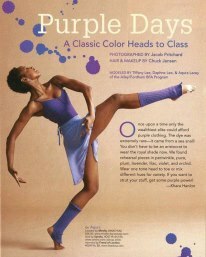 I knew when I was accepted into the Alvin Ailey/Fordham University B.F.A. program, that I was a talented, passionate dancer and with the opportunity, I could dance professionally. Dance Mogul: How did you develop your work ethic? Aqura Lacey: Starting late to dance and especially technique, I always felt a few steps behind. I was constantly observing, learning, asking and fighting to look closer to what I was surrounded by. At the ballet school, it was the Louisville Ballet Company and at the Ailey school, it was the first company. I really get pleasure from the process of working with a choreographer. Picking up on their style, pushing myself to adapt and conform in a way to the task at hand. There is never a finish line or you never reach “perfection”. The work, the process, trial and error, the struggle and constant hunger to “get it right” or even to try something foreign to you is so addicting. When you start to see results, it’s like a nudge to keep going. Aqura Lacey: I was, unfortunately, not able to finish my last year of college, due to financial difficulties and that meant that I could no longer continue my training at the Ailey School. Then, I was asked to be a member of Ailey II. That has to be the most memorable moment in my career so far. I have toured the world from Greece, France, Italy to Bulgaria, Bermuda and several places in between. I was blessed to have worked with choreographers that I had only read about and traveled to places that felt like I walked into a postcard. My first performance was in the summertime on an outdoor theatre in France, this is the same girl from the block on the South Side of Chicago, really? I’ve appeared on Poland’s ‘So You Think You Can Dance’ and Bulgaria’s ‘Dancing with the Stars’. I had an opportunity to appear in Dance Magazine, a workshop for Beyonce and even perform on stage with the Alvin Ailey American Dance Theatre. I have truly been blessed. Aqura Lacey: Giving back is another rewarding feeling. Dance was here long before me and will be here long after. I have my experiences and I am still writing my story. Sharing my information to other young emerging dancers just helps to make a mark in their lives. I love to dance so much, I wish everyone could feel what I feel on a daily basis. There are so many “me’s” out there, just the thought of one person getting inspired and opening them up to another possibility makes my heart blush. Everyone started from someone else, a Ms. Aundra or whoever, going the extra mile and caring a little more than you thought. Don’t EVER forget that. Aqura Lacey: My advice to the younger generation of dancers is to first know your history in dance and all of the pioneers that came before you. You have to be aware of what is going on in around you in your time and figure out what part you want to play in it. Make sure you obtain as much information as possible, techniques, styles, genres or whatever there is to come. Whatever you do, NEVER stop investigating. There is always more that you can do. Dance Mogul: How do you get the younger generation to understand that the discipline in dance is the same discipline that needs to be executed in an educational setting? Aqura Lacey: Dance is so rewarding in so many ways. Discipline, no matter the technique is 101. It teaches you how to carry yourself, how to represent yourself and shows an amount of respect. Those qualities can be applied in any environment. Aqura Lacey: Every decision you make in life is carving your story in history. It is our job to decide what legacy we want to leave behind. It could be as simple as how you present yourself in class when younger dancers are watching to how you receive the gift of movement and what artistic liberties you take with it. Dance is bigger than any one person. We are entitled to have a voice, we are artists, but we have to always have integrity in everything we do and be very aware of the story you want to be told. Aqura Lacey: Currently, I am in a serious investigation mode. I have recently worked with a diverse group of choreographer that really helped me to explore my limbs and capabilities. I am finding out more and more every day what feels good and compliments my body. Taking a wide variety of classes and just sculpting my art while discovering my voice. Aqura Lacey: We definitely need more publications like Dance Mogul to have more platforms to share information. Being in New York now and having building connections, asking questions and just observing peoples journeys have taken me so much further. I am not sure if I could say the same if I was in a smaller city with limited resources, opportunities, and examples. These publications really help to bridge a gap, answer some questions and show the reality of this dance culture. Aqura Lacey: There are so many people, teachers, and organizations that helped me get to where I am, most are mentioned above. To add on, The ArtsReach program in Louisville and the Fund for the Arts who continue to bring the arts to youth. Thank you to all of my teachers for your patience and passion for what you do. Thank you to every dance pioneer that has come before me that have paved the way. Thank you to the Ailey foundation for giving me a home in New York. A special thank you to my grandmother, “Gram-cracker” (R.I.P.) for being such a strong, beautiful, black women who never let me down and provided me with all of the tools it takes to succeed in this world.